As some of my readers may know, I've tried to follow along with The Morning Show Book Club lead by Janet Joy Wilson over the past year. 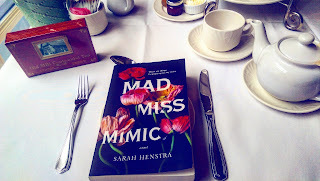 Janet Joy's recommendations have never let me down and Mad Miss Mimic by Sarah Henstra was another hit in my books. You can read my full review and check out the book trailer here. As part of the March selection, The Old Mill also graciously sponsored the perfect contest to along with the book. The grand prize was tea for two with Janet Joy and Sarah Henstra. It took a few months to co-ordinate schedules, but we finally made it happen last Sunday. There was so much for me to be excited for: an outing with a friend I rarely get to see, a person I've never met but often connect with via social media, the author of a book I still can't stop raving about and tea time at one of my favourite places in Toronto. The tea and all of its accompaniments were delicious. My favourite items were the scones with Devonshire cream and the lemon meringue tartlet. Unfortunately, I didn't bring my phone so you'll just have to imagine how beautiful each of the little items were. Or, you can just check out the Old Mill's Afternoon Tea menu here. The four of us shared in some really great conversations about life, new adventures and parenthood. We also managed to reign our conversation into official book club business and discussed Leo's adventure with Sarah. One of the burning questions that we all had for Sarah was how she decided on using mimicry as Leo's distinguishing feature and it revealed an interesting tidbit. Sarah responded by telling us that her original idea for Leonora was for her to have been a forgery master. Having the ability to copy documents to a tee. However and thankfully... Sarah decided that forgery would be hard to explain and visualize in the book. Another item that came up during our conversations was the Author's Note at the back. It explains some of the history behind the opium problem in the 1870's and leaves readers with her sources for additional reading. Sarah also revealed some news on her latest book and a couple new skills that she's working on. But I'll leave that for you to discover on your own. Overall, a fantastic afternoon with great food and even better company. Janet Joy also made sure we did not leave empty handed. 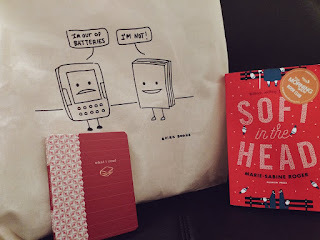 Giving each of us a cute tote bag from Quirk Books. (If you know me even a little, you'll understand why it makes me chuckle every time I see it. A copy of Soft in the Head by Marie-Sabine Roger. A beautiful story of an unlikely pair...review coming soon! And last but not least, a journal to log all of the books I've read. It'll definitely come in handy as I start to organize all my thoughts for upcoming posts. Both Sarah and Janet Joy can be found on various places online. Feel free to click around to learn more about them and the amazing work that they do.